Image of 25 King Street. Photo: supplied. Minister for Education and Minister for Industrial Relations The Honourable Grace Grace and Impact Investment Group (IIG) joined Lendlease yesterday to celebrate the official opening of Australia’s tallest engineered timber office building, 25 King. 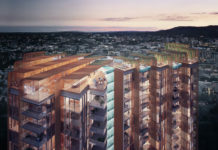 The first of its kind in the Australian property market, 25 King includes extensive use of innovative and sustainable building materials – glue-laminated timber structural beams and columns and cross-laminated timber floors – as well as state-of-the-art technology to deliver a true workplace of the future. 25 King Street was designed by Australian architecture and interiors firm Bates Smart. 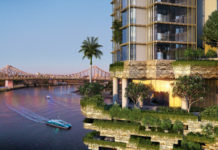 According to architect Bates Smart, 25 King heralds a move away from steel and concrete towards the more sustainable resource of timber. Acknowledging historic principles of timber construction, the structure combines Glulam (glued laminated timber) and CLT (cross laminated timber) – embodying Bates Smart’s research into engineered timber technology and typologies to meet modern-day demands of function and sustainability. The engineered timber structure is substituted for concrete or steel but with a significantly lower carbon footprint, with sequestered carbon locked within the timber structure. Philip Vivian, Bates Smart Director states that the building is raised on massive exposed timber v-columns and with the south facade expressed as a ‘verandah’ of engineered timber, 25 King covertly references the wooden vernacular of the ‘Queenslander’ building type as well as nodding to the historic pavilions of the Showgrounds district. Nine levels of open-plan office space, serviced via a north-facing side core, are balanced above a ground floor shaded timber colonnade hosting cafés and restaurants, which open up the building as part of the public realm. According to Bates Smart, 25 King’s innovations in rapid modular CLT construction provide significant economic and environmental benefits. The extensive pre-construction design process and off-site fabrication led to a significantly shortened and cleaner on-site construction programme with minimal waste. The building was constructed in 18 months, with the facade envelope following structure in a floor-by-floor sequence. Lendlease Managing Director for Urban Regeneration John Burton explains that 25 King is the latest example of high-performance workplaces setting new benchmarks in building practices. 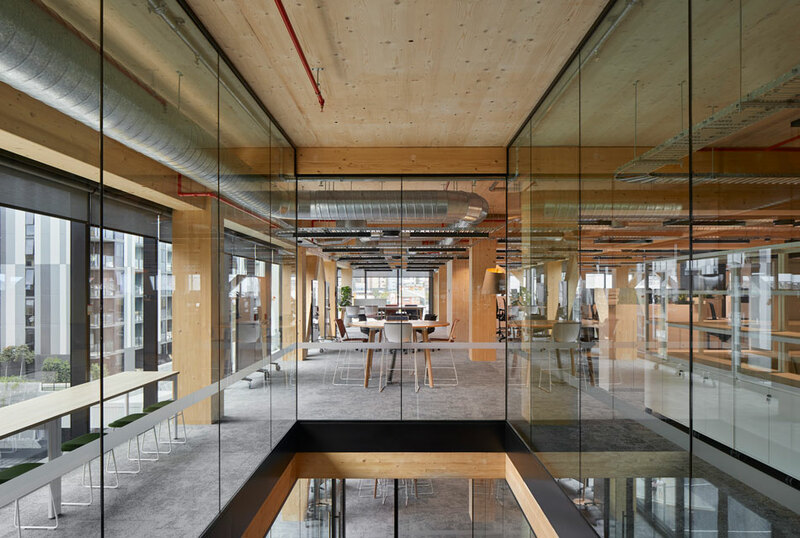 “The building demonstrates greener and healthier ways of working. This creates a workplace that lives and breathes a culture of collaboration providing workers with a sense of belonging.